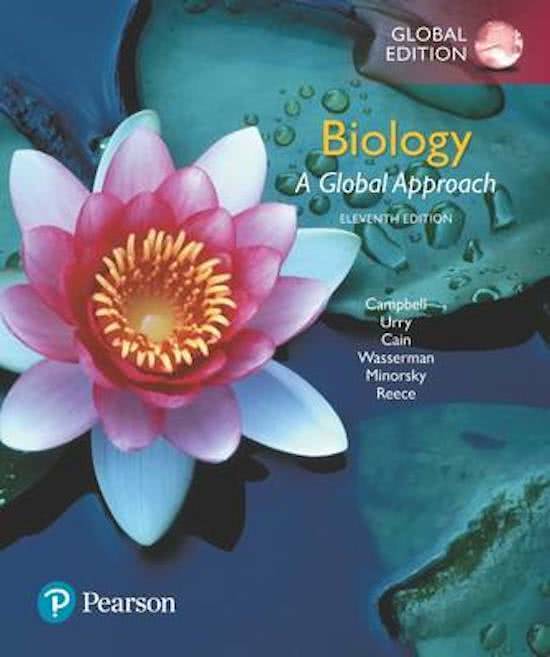 Celbiologie Campbell H5- Biological Macromolecules and Lipids (Engels) Here is a compact but comprehensive summary of the fifth chapter from Campbell's Biology, A Global Approach. The summary contains many pictures and precise explanations. The summary is written in English, but very understandable (probably contains grammar errors). Unit 5 Chapter 26, Campbell Biology 11th Edition A summary of Unit 5, Chapter 26 - Phylogeny and the Tree of Life. Includes key concepts, notes on each concept, and questions/answers. Campbell Celbiologie H7- Cell structure and function (engels) Here's a compact but comprehensive summary of the seventh chapter from Campbell's Biology, A Global Approach. The summary contains many pictures and precise explanations. The summary is written in English, but very understandable (probably contains grammar errors). Thermodynamics The folder contains topics from biology and chemistry topics for period 1 in Maastricht university science programme. It has all the necessary documents from few selected topics from Biology Campbell textbook (biology) and Principles of general chemistry textbook (chemistry). Cell bilogy and other general understanding The folder contains topics from biology and chemistry topics for period 1 in Maastricht university science programme. It has all the necessary documents from few selected topics from Biology Campbell textbook (biology) and Principles of general chemistry textbook (chemistry). Cell Structure & Function - Summary A concise summary of cell structure and function with a focus on the main organelles in eukaryotic cells - eg. nucleus, endoplasmic reticulum, cytoskeleton etc. Brief coverage of which microscopes are appropriate for viewing certain organelles and their resolutions (needs to be memorised for exams.) Relevant to biomedical science, medicine, biochemistry, microbiology, molecular biology, animal sciences, biological sciences and A-Level biology students. CHAPTER 5 PHOTOSYNTHESIS Complete guide for basic in Photosynthesis. A Tour of the Cell Outline of Chapter 6 Campbell Biology. Includes information about prokaryotic and eukaryotic cells and cell organelles. Molecular basis of inheritance Characteristics we inherit depend on DNA in the molecular level. These notes explain all the components of the DNA and its constant replication in an organized way. The notes are colorful and have many diagrams. Mitosis & Cell division Biology notes&sol;learning outcomes for "mitosis & cell division&period;"
Mitosis & Cell division Biology notes/learning outcomes for "mitosis & cell division." Chromosomal inheritance Biology notes&sol;learning outcomes for "chromosomal inheritance&period;"
Chromosomal inheritance Biology notes/learning outcomes for "chromosomal inheritance." Introduction to biology This document is about biology. This is a brief introduction to biology. Sur cette page, tu trouveras des résumés, des guides de révision et bien plus de livres de révision Biology, écrits par Neil A. Campbell & Lisa A. Urry. Les résumés sont écrits par les étudiants eux- mêmes, ce qui te donne les meilleurs renseignements sur ce qui est important de réviser dans ce livre. Les sujets tels que biology, cell structure, Campbell, science, Celbiologie, celbiologie, molecular biology & Samenvatting seront traités.